We pack our syrup in glass bottles or plastic jugs. The glass bottles are imported. 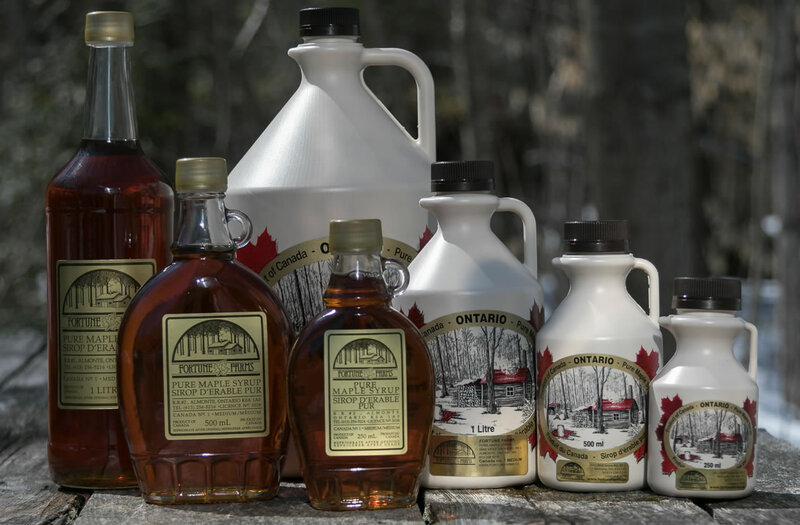 The plastic jugs are made in Canada from food grade material maple syrup may be stored for prolonged periods in either container as long as the seal is not broken. After opening the syrup should be kept refrigerated. Storing the syrup in a freezer will help retain its fresh flavour for a longer period. It can be safely frozen in either the glass bottle or jug. Maple “butter” is made from pure maple syrup. The syrup is boiled to a very soft sugar stage. Then stirred as is cools to produce a soft, creamy product for spreading on toast or buns. It is packed in jars It may separate to syrup and sugar in a manner similar to peanut butter. The consistency can be recovered by simply stirring. Maple sugar candy is produced in a variety or shapes and sizes. It is packed in bulk or in gift boxes. Maple fudge is a mixture of maple syrup, butter and cream. We make this product only during the maple season. It is a very rich, smooth tasting creamy product. Storage does not seem to be a problem as it quickly “disappears”. Maple granular sugar is made by boiling the syrup to a high temperature and stirring as it cools. The syrup crystallizes into granular sugar and is then sifted to remove any lumps and packed in bags. Maple vinegar is made by fermenting partially boiled maple sap until it turns to vinegar. This takes several weeks. The vinegar is then aged for a year or more in an oak barrel to enhance the flavour. It has a unique flavour and is excellent for making salad dressings or sauces using your favourite oils and spices. It is packed in glass bottles. We ship maple products all over the world. We will be pleased to quote price and delivery cost for our products. We will need a list of the products and the shipping address to complete the quote.Payment may be made by Visa or MasterCard or by cheque. Order by phone: Call (613) 256-5216. There are different grades of syrup based on colour and flavour; to decide what’s best for you, visit our Maple Syrup Grading page.